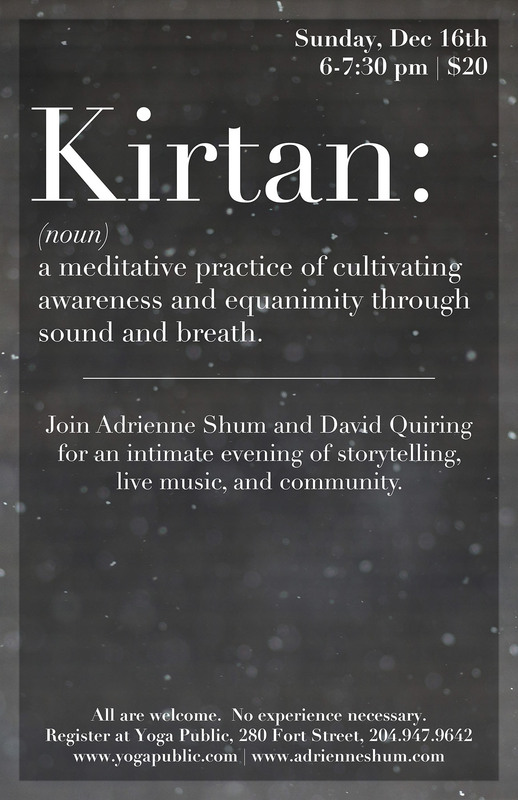 Join David and I for an evening of Kirtan, a meditative practice of cultivating mindfulness through sound and breath. We will be doing our last kirtan of 2018 at Yoga Public on Sunday December 16th (6-7:30 pm, $20). The winter solstice is December 21st, so as we approach the darkest day of the year, let us join together and share our inner light. Kirtan uses mantras to develop awareness and equanimity. Mantras are short repetitive phrases, and while they might seem esoteric at first, we are all already repeating mantras to ourselves – but usually they are negative things like, “I’m not worthy” or “I don’t belong.” We need to hit the reset button, and practice helps with that. Recalibrate yourself with traditional mantras that call in compassion, love, and understanding. All are welcome and no experience is necessary! Enjoy the opportunity to be transformed through the power of live music, storytelling, and community in an intimate setting. All you need is to come prepared to sit (chairs will be available) and soak it all in. Pre-register at www.yogapublic.com. See you there! Stay grounded this holiday season. The holidays are a busy time for us all, and self-care is usually the first thing that gets pushed aside amidst the flurry of activities. Even when you think there isn’t enough time to take care of yourself and to practise yoga, it is so worth making time for it. Practice can help you to reset and feel grounded again, so that you can be more fully awake and appreciative of whatever this joyful season brings. 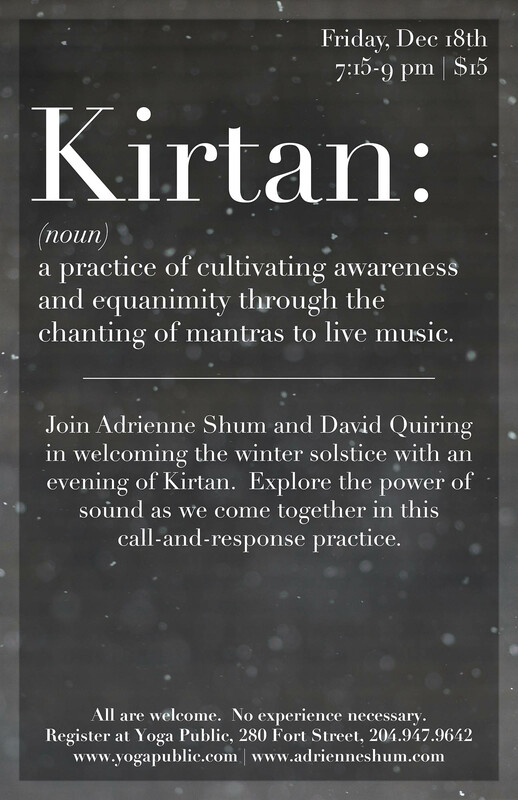 David and I hope you can join us for a Kirtan at Yoga Public on Friday, December 18th, 7:15-9:00 pm ($15). The winter solstice will be a few days after, so we will be marking the passing of time with chanting and music. Hope to see you there!